There have been countless patients over the years that experience a facial rash within a few days after coloring their hair. There are a number of different reasons for this — the most common of which is the hair dye itself. Despite this fact, nearly every patient that I encounter seems to be surprised that coloring their hair would result in a facial rash, especially because they have used the same hair coloring for years (sometimes even decades) without any problems. The reason that a rash first occurs on the face after coloring the hair is that the skin on the face is much thinner and far more reactive, than the skin on the scalp. In fact, the scalp skin is so thick, that reactions to hair dye only rarely cause rashes on the scalp. In addition, a person may have used a particular hair dye for many years without problems — until the immune system becomes sensitized to the chemical through an unnoticed cut, scrape or other disruption on the skin — after which the immune system reacts to the chemical present on the hair and skin. The symptoms of hair dye allergy include contact dermatitis (an itchy, flaky red rash) that most often occurs on the face, eyelids, ears, and neck. Severe facial swelling to can also occur with contact dermatitis to hair dye, which is often mistaken for angioedema. Angioedema, however, unlike contact dermatitis, is not red, does not itch, usually only occurs on one side of the face at a time, and does not peel or flake when the rash is healing. 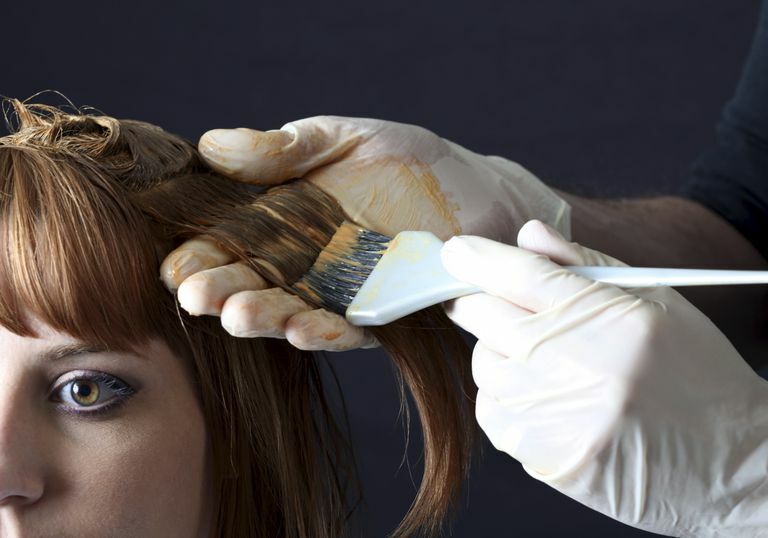 Symptoms of a hair dye reaction most often occur within 2 to 3 days after a person colors his or her hair. However, symptoms may last for days to weeks after the last time a person dyed their hair. 1. Para-Phenylenediamine (PPD). The chemical in hair dye most likely to cause allergic reactions is para-phenylenediamine (PPD). PPD is found in more than two-thirds of permanent hair dyes and is very effective at penetrating the hair shaft and follicle, as well as binding to proteins in the skin. These characteristics make PPD a potent contact antigen able to induce allergic reactions. For this reason, some European countries, including Germany, France, and Sweden, have banned PPD. Most hair dyes that are labeled as being “hypoallergenic” will not contain PPD as an ingredient. 2. Cobalt. Cobalt is another chemical present in certain hair dyes that is a common cause of reactions to coloring one’s hair. This chemical serves to provide the pigment in certain light and medium brown hair dyes. This is often an overlooked cause of reactions to hair dye, as people may assume that if they experienced a reaction to hair dye, that it must’ve been a result of PPD. However, a person allergic to cobalt will still react to a “hypoallergenic” hair dye because the hair dye will still contain cobalt, but lack PPD (the most common reason for reactions to hair dye). 3. Glyceryl thioglycolate. This chemical is found in permanent wave solutions that may be used in conjunction with hair dye. Since glyceryl thioglycolate is not found in the standard panels to test for contact dermatitis, it is a diagnosis that could easily be missed by an allergist or dermatologist performing testing for a cause of a person’s contact dermatitis. Therefore, if a person uses a solution to curl (or straighten) their hair, along with a hair coloring, it is important to consider all chemicals that could be the cause of a person’s facial rash. 4. Cocamidopropyl betaine. Cocamidopropyl betaine is a coconut-derived substance that is found in many shampoos, soaps, and bath products. This chemical acts as a surfactant — meaning that it produces “bubbles” — a characteristic of many soaps that provides the cleaning effects of the soap. Since Cocamidopropyl betaine is found in most shampoos, it is a commonly overlooked cause of contact dermatitis of the face. And, because shampoos and other products containing Cocamidopropyl betaine are found in hairstyling products, this chemical could be responsible for reactions after coloring hair. McFadden JP, White IR, Frosch PJ, et al. Allergy to Hair Dye. BMJ. 2007;334:220.